This week's theme at I Heart Faces is "Sweet Dreams." Car sickness, fighting for arm rests and constant noise is quickly forgotten when this sweet scene is beheld in the back of the momma-mobile. how precious! they are so sweet! that is so cute. 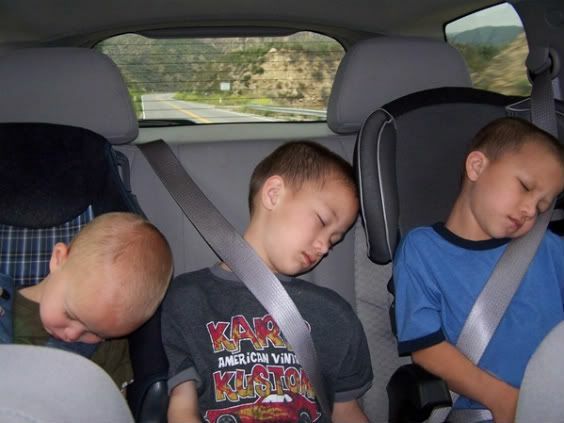 how often do they all go to sleep at once in the car? beautiful, wonderful....peace and quiet in the car. such a rarity! Great shot. It's so funny the ways kids are able to sleep! awww-- i have a few pics like that, too. and judging from the view thru the rear window, i bet you were on vacation when this was taken. 'cuz you don't actually have mountains in texas, do you? Wow! They all three have very similar profiles. What a great picture. Why can't that happen when I travel?! They look so sweet. Just how I love seeing my 3 in the car too! Great shot! This is such a sweet photo Marsha! Beautiful boys. This picture just brings a sense of peace and joy, doesn't it? This is definitely a wonderful sight. It makes you wonder how such sweet looking angels can be such busy, curious, destructive, peace disturbing little people whom you love oh so very much.